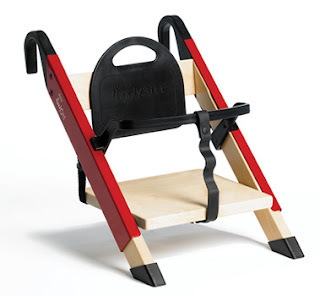 The ingenious, Danish Handysitt from Minui works as both a high chair and a booster seat for your child as they grow from 6 months to 5 years old. Not only does it allow them to eat closer to the table with the rest of the family but it is also light and compact for travel to restaurants or a friend's house. There is a three point safety harness and tether strap for security and fits to almost any chair. The chair comes fully assembled for immediate use and need no instruction as it is so intuitive to use. All of this and it is a designer's dream of simplicity, style and function. Available in several combinations of wood, stainless steel and colour and retails in Canada for $159.00.